You’re about to go on a first date. When your date comes to the door, he is holding a bouquet of roses. You are instantly impressed that he has taken the time to stop by one of those expensive florists and pick out an arrangement just for you. Now the flowers look a little less beautiful. This is how some people feel about generic medicines. But is the drug—less attractive in its packaging—still just as effective? Scott & White pharmacist, Emory Martin PharmD, said the potency of these medications is just as strong as their brand name counterparts and will be less of a strain on your wallet. 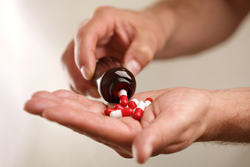 What constitutes a generic drug? What are the differences between generic and name brand drugs? Because the generic drug companies aren’t required to repeat extensive clinical trials, this can lead some patients to worry that the medications aren’t as effective. But, the pharmacist—who has been practicing for 30 years—said this is not the case. Is it ever a good idea to stick with a name brand instead of opting for a generic medication? There are two scenarios in which using a brand name medication might be a good idea – if only for peace of mind. When using transplant medications. The risk of losing a transplanted heart or kidney because of poor drug performance is so great that many transplant programs choose to continue brand name products even though a generic is available. Doctors and/or patients are just not willing to take a gamble, even if the gamble is very slight. When suffering from a serious medical condition. If a patient is suffering from a seizure disorder, and they are worried about any slight change in the way the drug is being absorbed into the body, they might take the brand name product because they want to avoid a serious medical event. But even though there are cases where doctors and patients might opt for the name brand, Dr. Martin said that for most medical conditions, the generic medication works just as well. And most hospitals and chain pharmacies only carry generic drugs made by reputable generic drug manufacturers. But if you’re still feeling uneasy about buying a generic medication, ask your pharmacist what companies they use to supply their generic drugs and check those companies out. “You want your pharmacist to say, this is one of the generic manufacturers I get many of my products from. I’ve been buying from them for several years and they’re really well-known,” Dr. Martin said. What if I take a generic medicine and it doesn’t work as well as my brand name drug? Aside from the placebo-effect, there can be real variability in the performance of medications. But it isn’t because the medication is generic. It is because the patient is taking the drug in a different way each time they swallow.